Dressage Mirrors specialise in the manufacture, and installation of arena mirrors, to the equestrian and dressage industries, including private stables and equestrian colleges. Our mirrors are manufactured to the highest standards and are competitively priced. 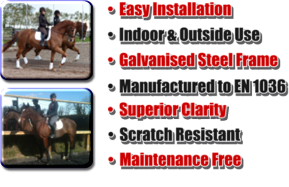 Training horses to display their elegance, is a passion “dressagemirrors.co.uk” understand, using strategically placed mirrors in your arena, help you monitor your horses important movements. Installing Mirrors to your Arena offer the rider a clear indication of how well they are riding. Attention to detail is key and quality of movements matter, monitoring these all important movements in mirrors gives a true indication of you and your horses hard work! Not only do they look very professional, they can help you get better results and Improve your accuracy. 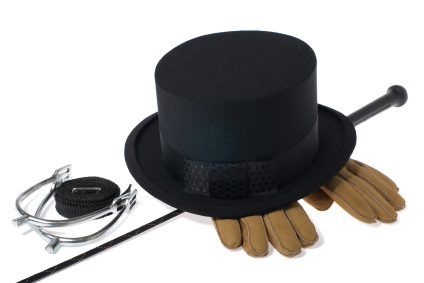 When trained well dressage horses can smoothly respond to a skilled riders minimum commands and perform the requested movements while remaining relaxed and appearing effortless. 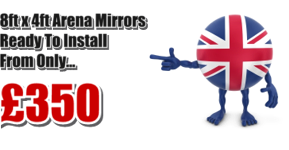 For more information about our mirrors please call today on: 01902 791975 or 07737 263611.